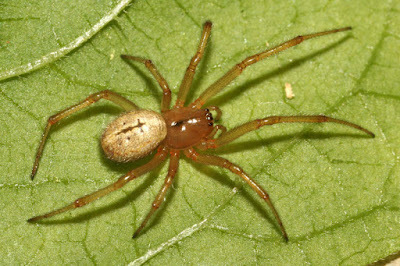 Female Enoplognatha mordax, from Pavouci. Enoplognatha is a cosmopolitan genus of cobweb spiders that commonly have patterned abdomens. Males of this genus have large spines on the front margin of the chelicerae; females have a single tooth on the hind margin of the cheliceral furrow (Wunderlich 1976). [PS08] Pinzón, J., & J. Spence. 2008. Performance of two arboreal pitfall trap designs in sampling cursorial spiders from tree trunks. Journal of Arachnology 36 (2): 280–286. [W76] Wunderlich, J. 1976. Zur Spinnenfauna Deutschlands, XVI. Zur Kenntnis der mitteleuropäischen Arten der Gattungen Enoplognatha Pavesi und Robertus O. Pick.-Cambridge (Araneida: Theridiidae). Senckenbergiana Biologica 57 (1–3): 97–112.